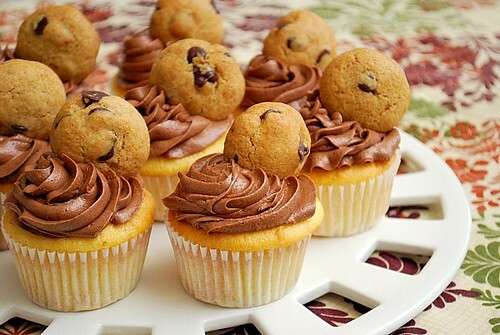 Everyone loves a good chocolate chip cookie and the same goes for cupcakes, right? So why not combine the two and make a double delicious treat?! 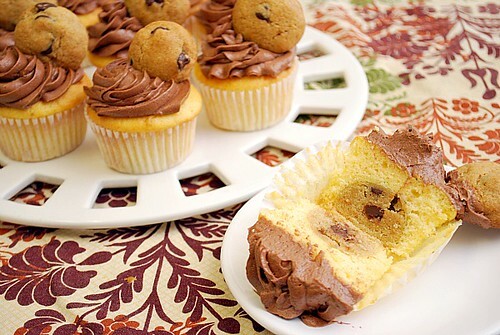 These Chocolate Chip Cookie Dough Cupcakes are what happens when a chocolate chip cookie and cupcake comes together. Nestled inside a yellow cake is a middle of chocolate chip cookie dough with a creamy chocolate frosting that's garnished with a mini chocolate chip cookie! When I saw this recipe, I knew I had to make it. I've had this recipe bookmarked for a few months and only came across it when it was time for me to clear out the long list of bookmarks I had. Why I waited so long to make this, I'm not sure... but I'm so glad I finally did. It's truly a decadent cupcake that combines the best of both worlds! I used a standard chocolate frosting, but you're welcome to frost with whatever flavor you want. I also made extra chocolate chip cookie dough so that I could make mini chocolate chip cookies to use as a garnish as well. You can probably create other similar cupcakes using your favorite cookie flavors... something I'd like to do when I get a chance. Whisk together the flour, baking soda, and sea salt; set aside. Beat the butter, white sugar, and brown sugar with an electric mixer in a large bowl until smooth. Add 1 egg and the vanilla extract and beat until smooth. Mix in the flour mixture until just incorporated. Fold in the chocolate chips; mixing just enough to evenly combine. Form the dough into tablespoon-sized balls; place onto a baking sheet, and freeze until solid, about 2 hours. It's critical that these are frozen in order for the cupcakes to turn out correctly! Place a saucepan over medium heat and fill with an inch or two of water. Set a metal or heat safe bowl large enough to sit in the saucepan to act as a double boiler, making sure the bottom of the bowl is not touching the water in the saucepan. Add the chocolate to the bowl and stir until the chocolate is melted and smooth. Let cool to room temperature and set aside. In the bowl of a stand electric mixer fitted with the beater attachment, beat together the confectioners' sugar, butter, milk, vanilla and salt on low speed until combined, about 1 minute. Scrape down the sides of the bowl as needed. Increase the speed to medium and beat for 2 minutes, then reduce the speed to low. Carefully add the cooled chocolate and beat until combined. Once combined, increase the speed to medium and beat for 1 minute more. If the frosting is on the dry side, add more milk, 1 tsp. at a time until it's creamy but still holds peaks. These cupcakes look amazing. Cookie dough is one of my favorite food groups! ahhhh I made these a long time ago and they were amazing you just reminded me I need to make them soon! These are so cute. I love the idea.